PCI passthrough is the process of attaching a PCI-E device directly to a VM; CPU support (namely VT-D for Intel and AMD-V for AMD) and motherboard support (IOMMU) are required for PCI passthrough to work properly. The system only has a single graphic card because it is normally used as headless compute server for which a GPU is not really required; the graphic card is also very very old Nvidia Geforce GTX260 with a standard non UEFI BIOS. 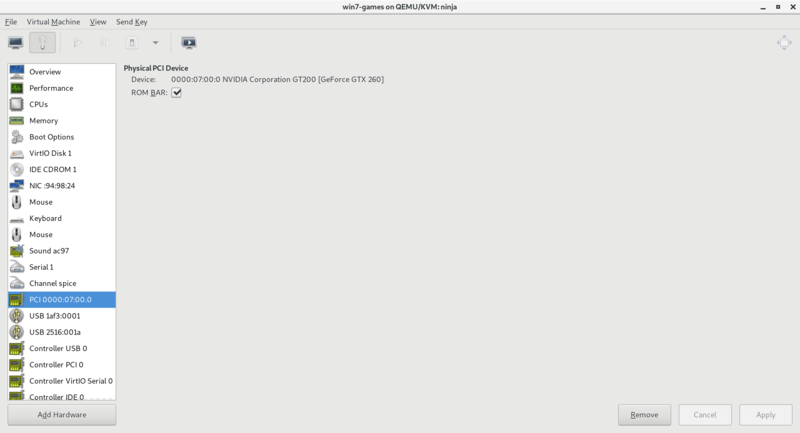 If using an UEFI enabled graphic card it is probably required to install the OS in UEFI mode using a virtual UEFI BIOS. This guide assumes you already have a working Windows virtual machine and are familiar with libvirt. GRUB_CMDLINE_LINUX=". . . amd_iommu=on modprobe.blacklist=nouveau video=vesafb:off,efifb:off . . ."
Before rebooting the machine be sure to have openssh running on the system. The lines above are required to trick nvidia drivers into thinking that they are running on bare metal, without it they refuse to work. At this point the only thing left to do is add the PCI device to the virtual machine in virt-manager. Don’t forget to also passthrough a mouse and a keyboard and also remove any other spice and virtual video card from the VM configuration.